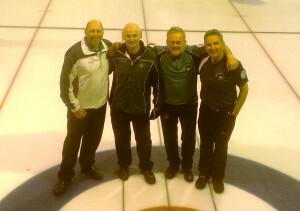 A new mens’ seniors team, formed out of the embers of Peter Wilson’s senior champs from 2013, took to the ice for the first time last weekend. Robin Gray, having now turned 50, takes over as skip with Peter playing third stones, PJ Wilson goes to second and coming in at lead is Tony Tierney. Tony, who was previously with the team that unforgettably won senior gold in 2012, was looking for a new challenge this season and Team Gray were more that happy to welcome him into the fold. The four of them got the stiffness out of their legs with an intensive two days of on ice action at Stranraer Ice Rink, including a high-quality bounce game against a Stranraer select skipped by Peter’s brother Philip. The team will now have their first competitive test playing in the European Senior Invitation at Greenacres in early November. This will be part of their preparation for the Irish Senior Championships at Dumfries Ice Bowl, 9/10/11 January 2015. The championships looks like being a three-way tussle between the new team, the current champions, skipped by Johnjo Kenny, and another team of challengers, rumoured to be skipped by David Smith.